Many Ghanaians continue to make their home country – Ghana proud on the international front. Some members of Ghana’s security agencies especially have been awarded for their United Nations (UN) peacekeeping efforts. 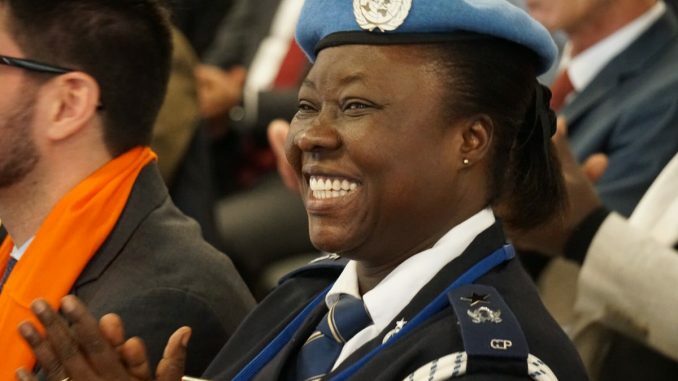 The latest to make it this time around is a Ghanaian Police officer who has been crowned the United Nations Female Police Officer of the Year Award (formerly known as the International Female Police Peacekeeper Award). Phyllis Ama Tebuah Osei, a superintendent of police from the Ghana Police Service but with the United Nations Mission in Somalia (UNSOM) was selected for the award as her policing work, directly and positively impacted the community and the host state police in Jubaland, Somalia. The ceremony was co-hosted by the United Nations Police Division of the Department of Peacekeeping Operations and the Permanent Mission of Canada to the United Nations. According to the UN, Ms. Osei was acknowledged for her contributions to enhancing the protection of women and girls, as well as her initiatives to promote women rights in the host state police, embody the spirit of the award and embrace the values of international policing. The award is to establish a role model for women police peacekeepers and to promote the UN Secretary General’s Gender Parity Strategy and DPKO’s Uniformed Gender Parity Strategy, through encouraging member-states to deploy more female police officers to peacekeeping and special political missions. “It is an honour to work for UNSOM, where I assisted in strengthening activities on gender and child related issues. I also support the police in Jubaland on issues of Justice and Human Rights,” the police officer noted. On his part, the United Nations Police Adviser, Commissioner Luis Carrilho, praised the awardee for her exemplary conduct. Phyllis Osei is the UN female peacekeeping officer of the year. Officer Osei has been particularly successful at initiating an adult literacy training for 49 female police officers in Jubaland. The training’s overall goal is to improve their literacy and increase their chances for future promotions. She also formed a Female Peacekeeper Network (FPN) within UNSOM and AMISOM to provide support to female peacekeepers. She holds three Master’s degrees from Middlesex University in the UK, the Ghana Institute of Management and Public Administration (GIMPA) as well as the University of Ghana. 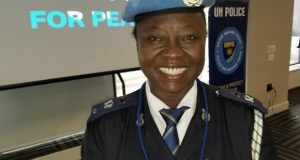 The post Ghanaian police officer wins UN female peacekeeping award appeared first on Citi Newsroom.